The tracker works as you'd expect but the infrastructure supporting it could do with an update. Be aware that you'll need to pay a monthly fee for the service on top of the fixed price for the device. The site www.dantracker.com which hosts the tracking UI is not served over https, which means if you're browsing to it over public wifi, anyone can see your user credentials and GPS coordinates of your tracked vehicles. Emailing their support address about this revealed that the address was no longer maintained. For price and ease of fitting I feel its a good product. Only down side is that I tried to track my motorcycle while in the back of the van and could not get a position only when it was out the van. It must be due to the metal van effecting signal. I wanted a tracker I could move between bikes and this fitted the bill. It does everything you'd want or need. The only gripe ... lack of instructions. The tracker arrives in a box with no instructions or links to download. After a good hour of searching, I had to contact Oxford direct who sent me a copy of the instructions via email. Then, for you to track, you have to download the app - but the lite version is useless so have to pay out for the full version...in the grand scheme of things £12.99 is nothing but when you've spent £200, then £60 to register the device, having an app that just works without an additional charge would have been a nice touch. It tracks well and knows where you are so all good. The iPhone displayed is NOT included. This is the simplest, cheapest and most effective way to fit GPS tracking to your motorcycle (or indeed any other vehicle or item you wish to track). Simply conceal the sleek tracker unit in the most appropriate place on your motorcycle and activate with your phone, tablet or computer! If your bike gets stolen, simply open up your Tracker App to find out where it has been taken anywhere in the world with a mobile network. The unit is compact and protects your vehicle or any moveable asset to which it is fitted. The Oxford Tracker is easy to fit on any vehicle and transferable between any vehicle or asset. The Oxford Tracker requires no tools at all, simply hide the tracker in the desired suitable location. You can quickly access a number of key features using your phone, tablet or computer, depending on what you need from the system. Worldwide coverage using Global Positioning Satellites (GPS) and a worldwide embedded SIM chip. 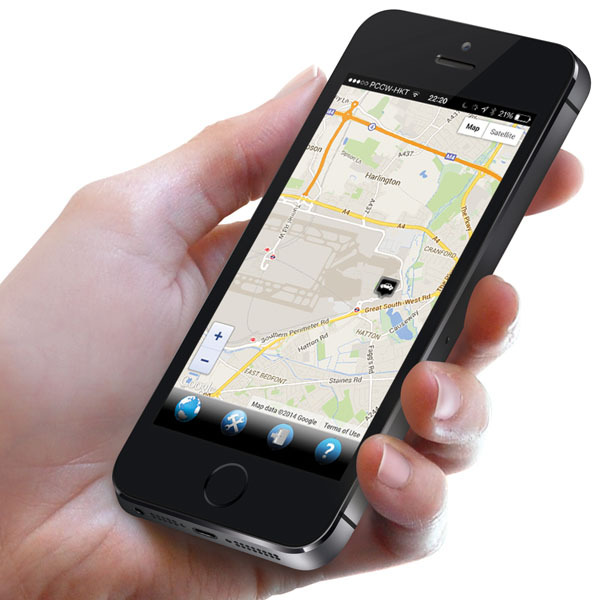 Positions viewable on Google maps from a PC or smart phone app, can also track multiple trackers on your account. The Oxford tracker has 4 different modes for effective tracking of the motorcycle or vehicle. Sleep mode; this is the default mode which provides a tractable location after the tracker has been still for 5 minutes. New locations are only provided if the tracker is moved to a new location. Live mode; under set-up you can put the tracker in live mode, which means that you receive a new position every 5 minutes, providing the tracker is moving. Geofence mode is a geographic (geofence) area around the tracker. If moved beyond this area, the user automatically receives an email message about the movement. You will receive a new position every 5 minutes, providing the tracker is still moving. It will show a track bearing line from the geofence area to the new location. Alarm mode if you need to report a stolen object, you can do so by activating the alarm button and entering your password. Your secure mark, which is always included, will now be shown stolen in the system. A compact tracking unit which protects your vehicle or any moveable asset to which it is fitted too, never worry again thanks to this trackable GPS unit. Easy to fit on any vehicle and transferable between any vehicle or asset, this magnetic version can be easily attached to a metal surface - if you desire a more 'steathly' install. Worldwide coverage using Global Positioning Satellites (GPS) and a worldwide embedded SIM chip, so matter where your asset ends up, you'll be able to find it. Positions viewable on Google maps from a PC or the smart phone app, get a satellite view so you can familiarise yourself with the surroundings, or even take a look at the traffic. Have the ability to track more than one device on the mobile app, have one in your car, motorbike, boat, ATV, bicycle - even store it in your holiday luggage. This is the default mode which provides a trackable location after the Tracker has been still for 5 minutes. New locations are only provided if the Tracker is moved to a new location. Adjust the area around your tackier, if moved beyond this area, the user automatically receives an email notification about the movement. Use the app or website to see the new position. You can receive a new position every 5 minutes, providing the Tracker is moving. This is useful if you wish analyse your route over a journey or keep a closer surveillance on the position of the Tracker. By activating the Alarm mode you will receive an email advising the GPS co-ordinates every 5 minutes providing the Tracker is moving. You can then report the theft to the Police. Powered only by a lithium battery with up to 10 year life expectancy or up to 14,000 tracked positions, so you can place your tacker anywhere. do i need to buy sim for this device? or is this plug and go device? so when i purchase this device, i have to install it and pay for monthly subscription. is that all? last question is where do we pay monthly subscription, does it says on device manual? it seems just same as BikeTrac, but just a cheaper version then. A sim card is not required as the tracker uses a monthly subscription. All details regarding subscription services are included in the instructions. will the tracker still work without having a subscription? This tracker will not work without a subscription.